Star Camo Infinity GTX Mid from Solid Gear is a revolution for safety shoes. Endless cushioning and comfort has until now been impossible in safety shoes, but with Solid Gear ETPU we make it possible. The more energy you give, the more you get back. Upper with GORE-TEX® pearl membrane, Cordura and stretch gives Star Camo Infinity GTX low amazing properties when it comes to breathability, fit, flexibility and also 100% waterproofness. Solid Gear also introduces the users to the new developed NANO toe cap. 40% stronger than fiberglass, lighter than other materials used and also thinner than other non-metallic toe caps. Using PU-foam Sock Technology the comfort in this shoe is best in class. Slip resistance class SRC ensures the highest level anti-slip. Upper made from lightweight Cordura with TPU reinforcements and GORE-TEX® membrane. 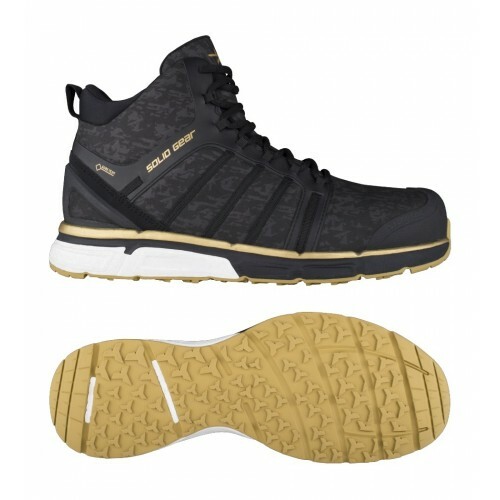 Outsole made from anti-slip and oil resistant rubber with an ETPU and EVA midsole.